I just purchased camper tiedowns and now that I have my camper on, I can't see behind it. What do you recommend? 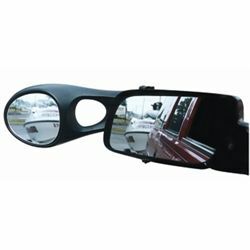 Cipa durable mirrors slide over the drivers side and passengers side mirrors on your vehicle. These aerodynamic mirrors have a tight fit that helps prevent vibration and noise and are custom designed for each vehicle. Use the Vehicle Search Guide to the left of the category to find the correct mirrors for you. Made by Cipa, Camco and JR Products we have a selection of Universal Towing Mirrors that slip on right over the existing mirrors on your vehicle.